Trionfi: History and Origin of Tarot. Research Project with Tarot Museum. 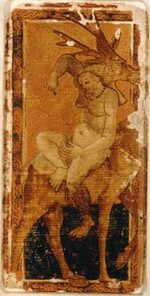 The Milanese Duke Filippo Maria Visconti commissioned before 1425 a manuscript and a playing card deck from Marziano da Tortona and Michelino da Besozzo. Jacopo Antonio Marcello got book and deck in 1449 and called it a new kind of Ludus Triumphorum. It is probable, that the first Trionfi-decks started with a 5x14-structure, the 14 trumps were considered as a 5th suit. 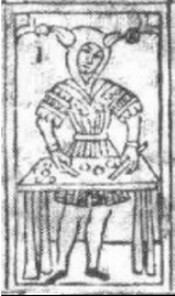 In 1423 Parisina, the young signora of Ferrara, imported from Florence "VIII Imperatori"-cards. It's unclear, which sort of cards it really had been, but it might be a predevelopment to the later Tarot cards. At the 1.1.1441 the painter Sagramoro got some money for "14 figure" for the guest in Ferrara, Bianca Maria Visconti. 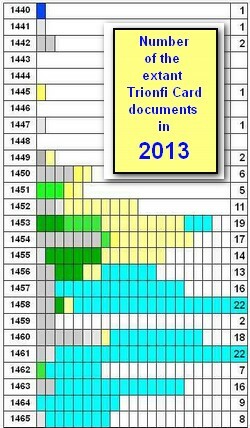 One year later appears the first use of the word Trionfi in relation to playing cards.